You would be forgiven for thinking that aside from the impeccable fashion, the most exciting spot at the Victoria Beckham show this Fashion Week was the entire Beckham clan taking pride of place in the front row. For me, however, the star of the front row show was Anna Wintour's hair. Her power bob is something of a beauty icon in its own right, and in the flesh, it's even easier to see why. Glossy, sleek and perfectly coiffed, it's the ultimate embodiment of chic. In fact, even Harper Beckham appears to have been inspired with the seven-year-old sporting her own high-shine, blunt-fringed bob. But just how easy is it to make this hairstyle work if you don't have the luxury of the best stylists in the business? I spoke to some industry experts to find out just how much upkeep a power bob requires. First, the good news: It turns out that a bob can suit pretty much everyone. A delightful turnout for me who has always believed that a short, sharp 'do would only accentuate my round face and, er, generous cheeks. Instead, it's all about finding a length that works for you. A short bob—one that ends by your ears—looks stunning on heart-shaped faces, as it balances out a narrow chin. A longer-length bob (aka a lob) works well on square or fuller faces by keeping everything in proportion. A mid-length bob like Wintour's is actually the most suits-all-style. 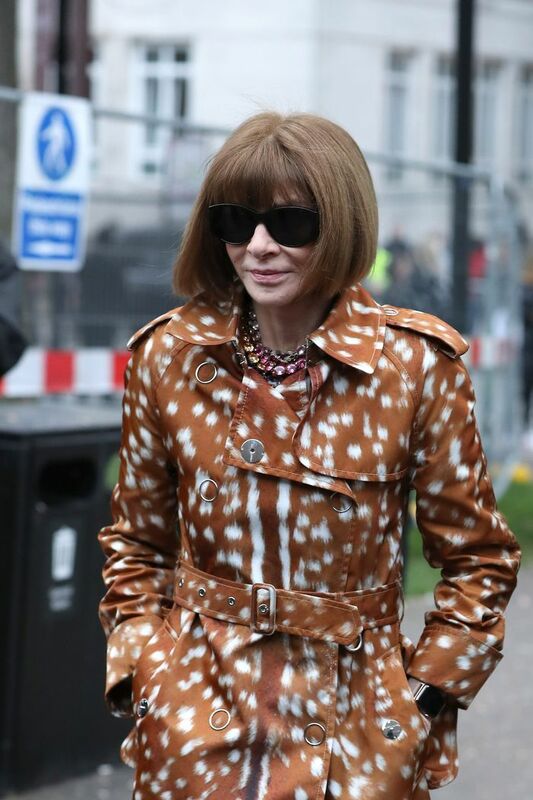 Make like Wintour and curl the ends under if you really want to frame your face. In terms of hair texture, stylist Simon Hill and owner of Sesh Hairdressing told us that this style "can be challenging if your hair is coarse or frizzy," as it requires a lot of work. "I think this look usually works best on those with naturally straight hair that is easily tamed, and, therefore, shouldn't require a load more styling." Similarly, Adam Reed, editorial ambassador for L’Oreal Professionnel, told us that "curly hair, or hair with slightly more texture, may suit a more choppy or looser version of the [bob]". Babba C rocking a glossy, mid-length bob. So now that we've got to grips with the perfect power bob length, it's onto the styling. Not only is Wintour's hair always precisely snipped, but the finish is also always shiny, sleek and perfectly styled. You'll need two tools in your home styling arsenal: a good hair dryer with a precision nozzle and a pair of straighteners. Without these two items, achieving a Wintour-esque power bob just isn't going to happen. After washing, roughly dry your hair until it's about 80% dry. Concentrate on blasting the heat in at your roots to add volume—Wintour's bob might be sleek but it's never flat. Once it's almost dry, put on your precision nozzle, and using a round bristle brush, continue to dry your hair down from the roots. This will help to de-frizz and add shine. Move your brush slowly from root to tip, almost stretching the hair as you go. Once your hair is completely dry, take your straighteners and run them over your hair, curling under as you reach the ends to give that expensive-looking finish. Sophie Rosemary wears her bob with slightly feathered ends for a modern take. You've cut it and you've styled it, but how do you care for your bob once you've taken the plunge? There's no doubt that bobs require a certain amount of maintenance. You'll need a trim every four weeks to keep the ends sharp and blunt. If you haven't got a fringe, then you could probably stretch this to six weeks at a push. When it comes to daily maintenance, it's likely that with this shorter style, you'll need to wash your hair more regularly (every other day, at least). This, combined with a serious amount of styling, means you should look for products containing hyaluronic acid or wheat proteins to restore moisture and elasticity to your hair. Always use a heat protection spray before styling to prevent damage and split ends too. If you're not sure you're ready for the full bob commitment, stylist Neil Barton, owner of Neil Barton Hair, suggests trying a longer-length bob: "A bob that is slightly longer in length is slightly easier to style on a daily basis, as you can wear it waved or even tie into a low ponytail to avoid having to style it each morning." Try a bob without the fringe like Kicki Yang Zhang for a more low-maintenance approach to the hairstyle. Scroll down to shop our power bob haircare must-haves. Use the magnetic smoothing nozzle attachment for the sleekest of blowdries. A boar bristle brush that actually reduces the amount of time you need to spend under the hair dryer. The original and best straightener for a good hair day. Providing heat protection with an added dose of smoothness, this is a blow-dry essential. This is a dose of serious shine for hair types that struggle with luminosity. Next up, the seven cult accessories taking off at London Fashion Week.